In 2018 we had 3,010 volunteers for a total of 18,232 volunteer hours! Thank you all!! NEW! We now have online Volunteer Calendar and Sign-up! Partnering with families to create a better future is a complicated process. Whether it is helping out in the ReStore, working on a job site, supporting an event or working in Habitat’s office, it takes hundreds of people to build a Habitat home. If you are looking for a way to make a real difference in the lives of people, we have a place for you at Rutherford County Area Habitat for Humanity. As a volunteer for Rutherford County Area Habitat for Humanity, there is always a place for you to bring your unique talents and skills. Experience is not necessary to volunteer with us. Our staff will provide you with all the training needed. Our partner families work alongside many of our volunteers while they are earning sweat equity, so it’s a great way to meet future Habitat homeowners. 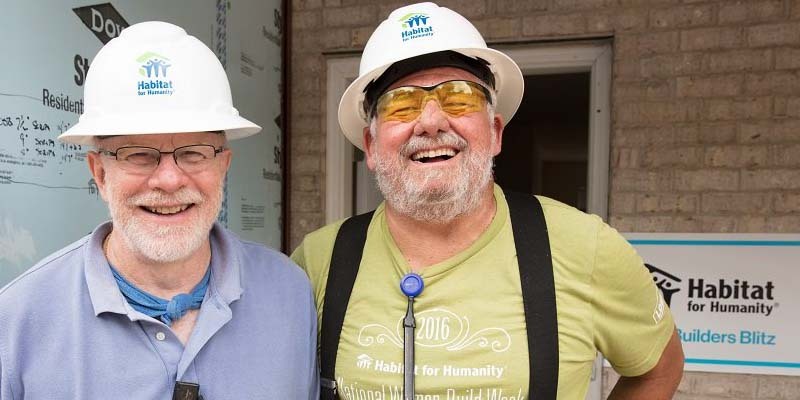 The most well-known of Habitat for Humanity’s volunteer opportunities is construction volunteers. They are continually in demand due to Habitat’s ongoing building efforts. No construction experience or skills are required, though volunteers must be at least 16 years old. Construction volunteers help us build on Wednesdays, Fridays, and Saturdays. Volunteers undertake dozens of home construction tasks such as framing, roof decking, vinyl siding, interior trim, painting, landscaping and so on. Every volunteer day as well as task is just as important as the other as they all come together to build a home. Volunteers are scheduled on both an individual and team basis. This video is a little old – and we provide gloves and tools, and we don’t use scaffolding – but it’s a good general construction safety video, with contractor and TV Host Steve Thomas. In addition to helping Habitat ReStore provide decent places to live for families in your community, you also can expect a great time while volunteering at Habitat ReStore! You’ll get to interact with ReStore staff as well as your fellow volunteers, which may include future Habitat homeowners. ReStore Volunteer Days are Monday – Saturday. Customer Service, Unloading Trucks, Pricing Inventory, DIY Projects, Furniture Repair, Organizing the ReStore Warehouse, & Helping With Donation Pick Ups. If you require community service hours for school, and agency or other reason, Habitat may be able to help you. Please review the following information. Volunteers desiring credit for community service hours must call the Volunteer Coordinator and/or complete an in-person orientation with Habitat prior to beginning service. RCHFH accepts all charges except theft and anything that is violent or predatory. Please allow adequate time to complete the required number of hours. While Habitat will work with you as much as possible, if you wait until the last minute, your needs and our schedule may not align. It is your responsibility to plan ahead. All volunteers are required to fill out a volunteer application and safety form prior to volunteering. Volunteers can pick up the forms at the RCHFH Office or print the forms off.